The OnePlus X comes packed into a compact paper box, which covers the basics - a tangle-free microUSB cable and a 2A charger plug. Or that's what it looks at first. Throughout our second rummaging through the retail package we also found a rubber bumper inside one of the paper holders, which has the SIM ejection tool. Influenced perhaps by the form factor the iPhone 6 and 6s have been using, we're slowly witnessing a comeback of the compact, yet premium mid-rangers. We already met the Xperia M5, the Xperia Z5 Compact and the HTC One A9. 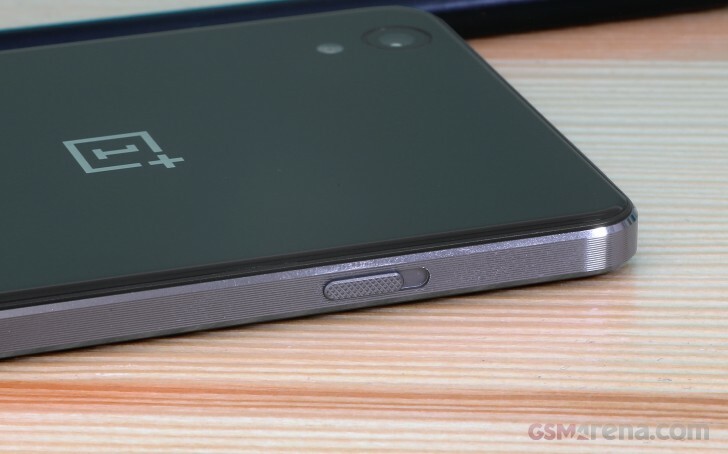 The OnePlus X is also relying on a 5" display and is made out of premium looking materials. The OnePlus X spreads at 140 x 69 x 6.9mm, which is about 6mm shorter, 2mm narrower and a hair thinner than the One A9. The OnePlus X is also lighter at 138g. OnePlus X is a step back from the company's sole focus on the specifications and it shifts the focus towards the design. And you can definitely see the effort OnePlus invested in designing the X by just taking a look at the stunning Onyx version. Both the glass and ceramic flavors of the OnePlus X have an anodized metal frame with 17 micro cut grooves running along the edges. The cuts are fine and give the sides a serrated finish making them inherently grippy. The front on both phones is covered by a 2.5D Gorilla Glass 3 - quite a popular choice lately, which creates the illusion of a thinner profile. The regular black onyx version has its back made out of glass with curved edges that flow gently into the metal sides. The ceramic flavor looks almost the same, but the edges are not curved but chamfered. OnePlus says the ceramic cover on those limited 10,000 units is cast out of a zirconia mold and takes 25 days to make. The Ceramic version has a high gloss near-perfect mirror-like finish and even more pronounced angled edges, as we've mentioned. While the process behind it is fascinating and the material is significantly tougher than the glass used on the Onyx material, in reality it is often hard to tell the two models apart, especially in dimly lit indoor environments. This does make it somewhat harder to justify the additional cost of the Ceramic version (it's extra $110/€100/£69). The OnePlus X Champagne flavor also stopped by, with an identical design to the Onyx Black model, only in a different color scheme. Arguably better suited to the gentler half of the population, the Champagne-on-white combo works equally well. We really appreciate the work of OnePlus and the attention to detail is among the highest we've seen recently. We like the sound switch on the left, which is nicely textured and provides a very prominent feedback. Handling the OnePlus X is a lovely experience and the grip is very good thanks to the etched metal frame. The phone is very compact, lightweight and offers surprisingly thin screen bezels. The OnePlus X is slippery in hand but the frame helps the grip, it fits nice in the hand, does great for one-handed operations and we had a great time playing with the phone. The front of the device has the 5.0-inch display in the center. Above the display is the earpiece, front facing camera, the sensors, and a tiny LED notification light at the top right. Below the display are the three practically invisible Home, Back, and Overview keys. They don't have any backlight and you will spot the markings denoting their places only under bright light. The Back and Overview are marked with simple dashes and you can switch the functionality of those from Settings. You can even assign dedicated actions on double tap or tap&hold on all three keys. On the right hand side of the phone are the power and volume control buttons with a nice damped feel, tight tolerances, and no unnecessary play. The ejectable tray is also around - it can either take two nano-SIM cards or a nano-SIM and a microSD cards. On the left is the sound profile slider from the OnePlus 2 with three positions for the silent, priority notifications only, and all alerts modes. The slider has a grippy pattern like the one on the OnePlus 2 and it works great. On the top is the headphone jack and the secondary microphone, while on the bottom are the microUSB port, microphone, and a single loudspeaker. The 13MP camera lens and a single-LED flash are on the back, sitting flush with the glass, giving it a perfectly flat appearance.